Order in the next 3 hours, 18 minutes an 43 seconds for same day shipping. The width makes this the perfect stamp for including a company logo and address. 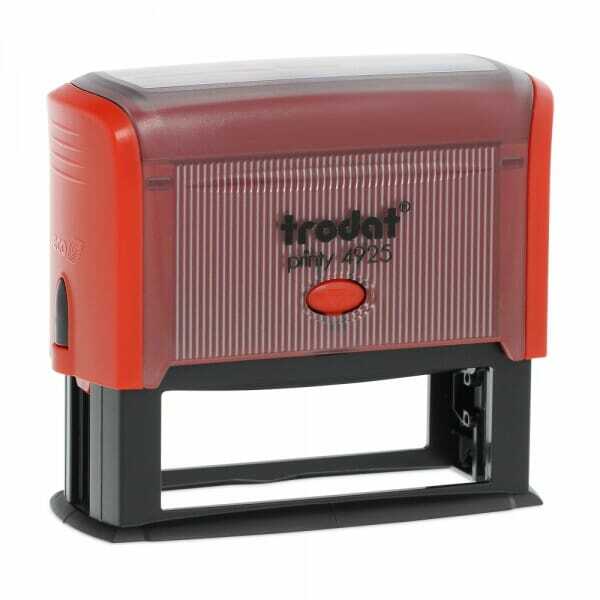 Printy 4925, part of the worlds most popular range of self-inking stamp. The 4925 allows for a maximum of 6 lines with a text plate measuring 82 x 25 mm. It is produced environmentally friendly from a high content of recycled plastic in an Austrian ISO 14001 certified factory. The online design wizard allows anyone to design their very own custom rubber stamp online, personalised with: a message, name, address, signature, email address or contact details. With an added image or logo if required. The suitable replacement ink pad 6/4925 is available in 5 different standard colours: black, blue, red, green and violet. Dry felt pads are suitable for special inks. Customer evaluation for "Trodat Printy 4925 82 x 25 mm - 6 lines"